The War on Syria and “The Death of Civilization”: The Assassination of Dr Khaled al-Assad, Guardian of Palmyra. At a meeting of the Foreign Ministers in Cairo in September 2002 the then Secretary General of the Arab League, Amr Moussa warned US President George W. Bush that the proposed invasion of Iraq would: “open the gates of Hell … in the region.” Iraq and Syria would be the first to be engulfed in the fire. There was of course no “crisis”, just a pack of lies to justify the illegal invasion for oil and to rid a government who had committed another unpardonable sin – switching oil trading from $US to Euros – and were a staunch supporter of Palestine. We are currently witnessing a similar murderous stitch up of another supporter of Palestine, Syria. Given the planning the United States has invested in destabilization of the country, aptly phrased by Syrian Military Intelligence in 2006 their: “efforts to provide military training and equipment to Syria’s Kurds” (3) and to “highlight Kurdish complaints” in order to implement another illegal “regime change” and resources theft there must be a fair amount of angst in Washington and Whitehall at resilience and government survival, though at huge human cost, approaching a decade later. The “highlighting of Kurdish complaints” though, clearly had time devoted to its complexities, being needed: “to be handled carefully, since giving the wrong kind of prominence to Kurdish issue in Syria could be a liability for our efforts … given Syrian civil society’s skepticism of Kurdish objectives.” Nevertheless, another plan for illegally overthrowing a sovereign government was underway, lessons from the Iraq nightmare ignored. The human cost of US meddling has, as ever, been staggering. According the United Nations Office for the Coordination of Humanitarian Affairs (UNOCHA) Syria’s 2013 population was 22,85 million. By May 2015 12.2 million people were in need of humanitarian assistance, 7.6 million displaced internally due to violence and 4 million had fled the country (4.) Incidentally for those who notice the discrepancy between the population and the UNOCHA figures, in crisis people return home to those they love: “If we die, at least we will die together” is a phrase that haunts. But the history of the region too is dying. The great, inspired monuments, witness to the triumphs and tragedies of mankind throughout millennia. 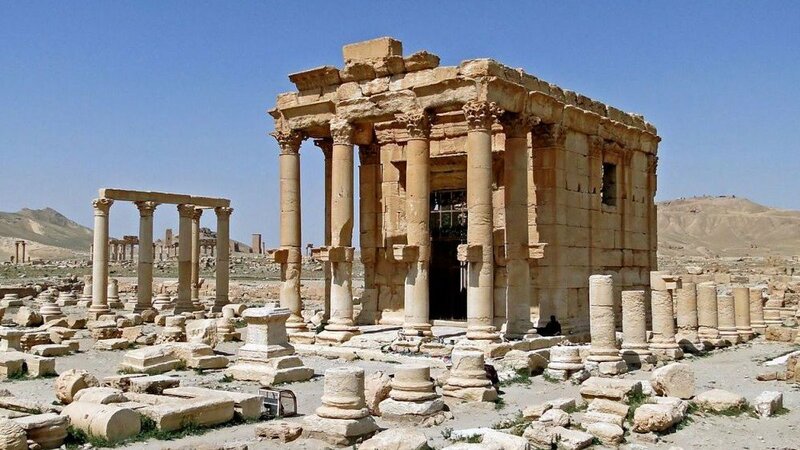 Pillars, buildings, sanctuaries, laughed in, loved in, hidden in, touched by, wondered at and revered by generations are being erased from Iraq: Hatra, Nineveh, Nimrud, Jonah’s tomb and Mosque, ancient churches, mosques, temples, priceless artifacts – and now a jewel of Syria, Palmyra. Palmyra first appeared in written records in the 2nd millennium BC, in cuneiform texts. It has been controlled by the Assyrians, the Persians, became part of Alexander the Great’s Macedonian Greek Empire. On his death in Babylon in June 323 BC, his empire was divided between two of his Generals, Ptolemy and Seleucus, Ptolemy controlling Egypt and Seleucus Babylonia, extending his power to Palmyra and much of Syria. IS seized Palmyra, “The Venice of the Sands”, in May. In June they were reported to have destroyed the 1,900 year old Lion of al-Lat statue, the five centuries old shrine of Sufi scholar Nizar Abu Bahaa Eddine and that of Mohammed bin Ali, descendent of a cousin of the Prophet. 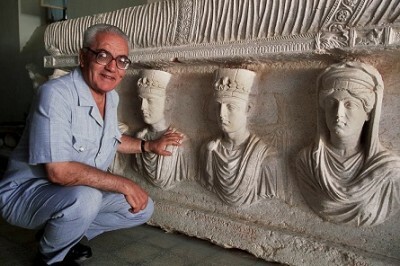 Shortly after this foray in to cultural genocide, the head and hand choppers with a penchant for burning people and more recently babies to death – seemingly continually “accidentally” dropped arms, food and medical needs by the US – kidnapped renowned archeologist Dr Khaled al-Assad, Palmyra’s Curator. On 18th August the US aid recipients beheaded the eighty one year old Dr Al Assad, for his refusal to reveal where many precious artifacts had been hidden according to his son, who was kidnapped with him but released. The body was hung from one of the great Graeco-Roman columns, his head placed between his feet. “I was born here, I will die here”, he said of his love for Palmyra. He died protecting it from the criminals whose priceless thefts from Iraq and Syria show up on eBay, and in London, European and US auction houses or antique shops (8.) Apparently, incredibly, this is near beyond authorities from border control to crime prevention, to halt. Seems the powers responsible for the carnage in the region are peerless at destruction, but worse than useless at prevention. A week later, on 30th August the ISIS crazies destroyed the Temple of Bel (also called Baal) consecrated to the Mesopotamian God, Bel where the lunar God, Aglibol and the sun God, Yarhibol were also worshipped. Dedicated in 32 AD was then the centre of Palmyran religious life. This latest victim of cultural genocide contained a cupola with the busts of the seven planetary divinities – Jupiter in the centre, surrounded by Helios, Selene, Ares, Hermes, Aphrodite and Cronos. It was surrounded by the signs of the Zodiac. The lintel at the entrance carried a carving of an eagle – wings outstretched across a star strewn sky – representing Jupiter/Bel. Eagles of course, also guarded one of Iraq’s recently lost wonders at the hands of the modern day barbarians, Hatra. Dr al-Assad, seeped in his love for Palmyra, who died for defending it had named his daughter after Zenobia, the third century Queen of the Palmyrene Empire, who led a revolt against the Roman Empire. Many have written that Iraq and Syria’s glorious archeology survived even Genghis Khan’s repeated assaults on the region but not the US and it’s terrorist beneficiaries. Genghis Khan (“Supreme Khan of the Mongols, King of Kings”) lived between 1162-18th August 1227. The 18th August was when Dr al-Assad was so appallingly murdered nearly eight hundred years later. A supreme, terrible irony – or something more sinister? Irena Bokova heading UNESCO has bleated that the destructions are a war crime but action is glaringly absent. Bokova led UNESCO’S activities for a Holocaust remembrance but has been silent over the ongoing Holocaust of perhaps two million deaths since the illegal invasion of Iraq. She was also instrumental in the exhibit: “The People, the Book, the Land – 3,500 years of ties between the Jewish people and the Land of Israel” inaugurated at UNESCO Headquarters in Paris on 11th June 2014. She is markedly less vociferous about the destruction of the history of the land, the years, guarded so faithfully by the countless generations of the indigenous people of the region. On 3rd September President Bashar al-Assad awarded Dr Khalid al-Assad a posthumous Order of Merit for his achievement and devotion to archeology, to be presented to his family at a ceremony arranged by the Ministry of Culture. There are times when the heart hurts, the soul hurts, the being wants to sob; mourning the sacrifices, the loss of legacy to future generations for all time cannot be borne. To meet Dr al-Assad and his love for Palmyra, see a modern legacy, his Facebook page (9) – and weep.